Muhammad Ali Cologne screenprinted logo snapback cap or hat autographed on the bill in thin black marker by the late, great heavyweight boxing champ, inscribed To Andrew and dated 4-10-90. 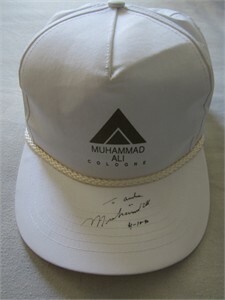 Obtained in person during his promotional tour for the cologne, with photo from the signing. Authenticated by JSA with their matching numbered sticker under the bill and Letter of Authenticity. ONLY ONE AVAILABLE FOR SALE.